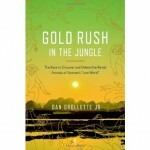 David is joined by Dan Drollette Jr to chat about his new book Gold Rush in the Jungle. This book, centered in Vietnam, examines many of the former war zones that due to their abandonment have become nature habitats. This are of the world, often referred to as “the lost world” has led to the discovery of never seen mammals including a half-goat/half-ox, a deer that barks, and a close relative of the nearly extinct Javan rhino.ece for the New York Times announcing that his views have changed and that he is now in favor of gay marriage.